Puppies sleep best in a cozy environment. Your puppy may experience separation anxiety the first few days or weeks in his new home. Now is the time to create structure in his life. Once he has a schedule and looks to you for direction, your pup will find comfort in his surroundings and sleep through the night. Purchase a dog crate. It should be large enough so he can stand, stretch out and turn around. If you purchase a crate to accommodate his adult size, put in a divider so he can't use the back to go potty. Make the crate comfortable and cozy. Place a blanket or towel on the crate floor. Avoid using newspaper or your pup will confuse the crate with a place to potty. Include a small stuffed animal for cuddling. Add a small battery-operated or wind-up clock to imitate his mother's heartbeat. Wrap it in a towel or set it outside the crate where your pup can hear the clock ticking. Hide small treats and favorite toys in the crate, and don't put him in it for a time-out or isolation time -- first, he needs to learn to like it. Under your supervision, a bit of cheese or other small-dog treat can help him view the crate as his den, a safe place of his own. Plan a nighttime ritual and stick to it. His last feeding should be no less than three hours before bedtime. Remove his water no less than two hours before bedtime. Before bedtime, take him out to potty and then plan some playtime. This is a chance for your pup to bond with you and work off his energy. Place him in his crate once he has calmed down from the nighttime activities. You may want to put a blanket or towel over the top of the crate to create a den-like environment -- dark and cozy. Prepare to have a few restless nights: Your pup will probably whimper. Since a small or young puppy cannot go eight hours without relieving himself, plan to get up a few times during the night when he whimpers to be let out. You'll soon learn which kind of whimper is for attention and which is a more serious demand. Take him to his potty area. Once he relieves himself, put him back in his crate in your room. Say goodnight in a matter-of-fact way, but do not play with or cuddle him. He'll soon learn that you're near when he needs help, but that bedtime is for sleeping. Consider putting on some soft music or a sound machine on low volume while he sleeps. Add a piece of your clothing to his bed so he has your scent. Do not put him in bed with you for some time. 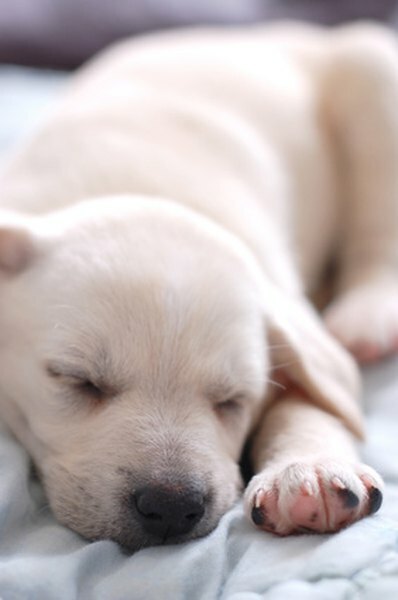 Depending on the puppy, when he is older and housebroken, you may decide to let him sleep with you. Do not scold your dog for crying; that will only create more anxiety. If you neglect to catch him in time and he soils his crate, calmly and gently clean and dry him. Then take him to his toilet area to get the idea while you clean the crate, and put him back into it with a clean blanket and toy. To avoid strangulation hazard, don't put a dog with a collar into a crate.